Digital Design 4 Edition (NOTE: Most chapters conclude with References, Drill Problems, and Exercises.) 1. Introduction. About Digital Design. Analog versus Digital. Digital Devices. 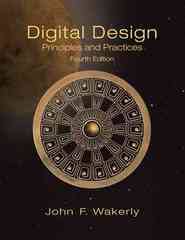 Electronic Aspects of Digital Design. Software Aspects of Digital Design. Integrated Circuits. Programmable Logic Devices. Application-Specific ICs. Printed-Circuit Boards. Digital-Design Levels. The Name of the Game. Going Forward. 2. Number Systems and Codes. Positional Number Systems. Octal and Hexadecimal Numbers. General Positional-Number-System Conversions. Addition and Subtraction of Nondecimal Numbers. Representation of Negative Numbers. Two's-Complement Addition and Subtraction. Ones'-Complement Addition and Subtraction. Binary Multiplication. Binary Division. Binary Codes for Decimal Numbers. Gray Code. Character Codes. Codes for Actions, Conditions, and States. n-Cubes and Distance. Codes for Detecting and Correcting Errors. Codes for Serial Data Transmission and Storage. 3. Digital Circuits. Logic Signals and Gates. Logic Families. CMOS Logic. Electrical Behavior of CMOS Circuits. CMOS Steady-State Electrical Behavior. CMOS Dynamic Electrical Behavior. Other CMOS Input and Output Structures. CMOS Logic Families. Bipolar Logic. Transistor-Transistor Logic. TTL Families. CMOS/TTL Interfacing. Low-Voltage CMOS Logic and Interfacing. Emitter-Coupled Logic. 4. Combinational Logic Design Principles. Switching Algebra. Combinational-Circuit Analysis. Combinational- Circuit Synthesis. Programmed Minimization Methods. Timing Hazards. The ABEL Hardware Description Language. The VHDL Hardware Description Language. 5. Hardware Description Languages. 5.1 HDL-Based Digital Design 5.2 The ABEL Hardware Description Language 5.3 The VHDL Hardware Description Language 5.4 The Verilog Hardware Description Language 6. Combinational Logic Design Practices. 6.1 Documentation Standards 6.2 Circuit Timing 6.3 Combinational PLDs 6.4 Decoders 6.5 Encoders 6.6 Three-State Devices 6.7 Multiplexers 6.8 Exclusive-OR Gates and Parity Circuits 6.9 Comparators 6.10 Adders, Subtractors, and ALUs 6.11 Combinational Multipliers 7. Sequential Logic Design Principles. Bistable Elements. Latches and Flip-Flops. Clocked Synchronous State-Machine Analysis. Clocked Synchronous State-Machine Design. Designing State Machines Using State Diagrams. State-Machine Synthesis Using Transition Lists. Another State-Machine Design Example. Decomposing State Machines. Feedback Sequential Circuits. Feedback Sequential-Circuit Design. ABEL Sequential-Circuit Design Features. VHDL Sequential-Circuit Design Features. 8. Sequential Logic Design Practices. Sequential-Circuit Documentation Standards. Latches and Flip-Flops. Sequential PLDs. Counters. Shift Registers. Iterative versus Sequential Circuits. Synchronous Design Methodology. Impediments to Synchronous Design. Synchronizer Failure and Metastability. 9. Memory, CPLDs, and FPGAs. Read-Only Memory. Read/Write Memory. Static RAM. Dynamic RAM. Complex Programmable Logic Devices. Field-Programmable Gate Arrays. Index.